A hugely entertaining bawdy and earthy ensemble piece looking at some of the first ladies ever to grace the English stage. A joyfully theatrical play both vulgar and deeply moving. As the characters sit backstage gossiping about their life and loves, and their somewhat fragile and often cruel place in a male world, they slip into various theatrical roles. 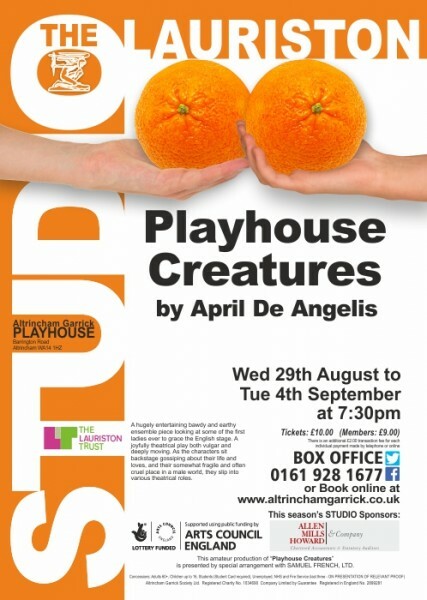 This amateur production of "Playhouse Creatures" is presented by special arrangement with SAMUEL FRENCH LTD.